If you have ever attended WedLuxe, you already know it’s not your average wedding show. Brides to be from all over attend this glamour-focused gala, looking for inspiration for the biggest day of their lives. You know, the one that remains immortal in photographs, Facebook and Instagram feeds forever. No pressure or anything. Basically this event is a big deal, and Atlantis Resort Bahamas needed our help to make their booth stand out. A challenge we were definitely up to! 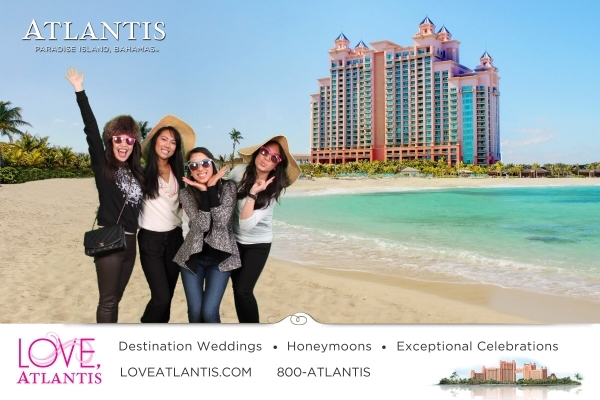 Using our iPad registration system, we collected information from participants and automatically entered them into a contest to win a honeymoon to Atlantis Resort. And then, just to get them really excited, using the magic of green screen, transported into scenes at the resort. We sent those photos to the guests through a branded email and microsite so they could share online and make all their friends jealous.